Borscht is probably one of my favorite things to make, almost more for the smell than the actual soup itself. The onions and garlic start off the journey and are soon joined by potatoes, cabbage and beets. The white vinegar provides an immediate tang to the air but soon melds with the others to create something that I've never quite experienced from any other soup. It's a deep earthy aroma but the beets provide an almost sweet overtone that makes it almost irresistible. It simmers on the stove for hours, filling the entire house with the flavor. Of course the soup is better the next day but after smelling it cook for hours I always have to have at least one bowl before I let it cool. Even if the flavor and aroma of this soup weren't enough, it's visually stunning too. As it simmers, the beets turn everything in the pot into a deep blood red color. 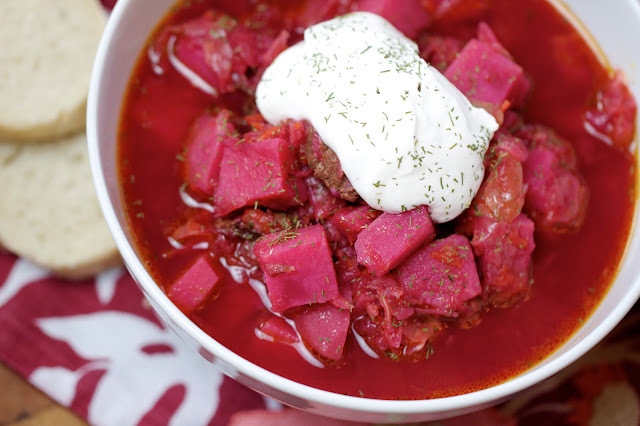 It's vibrant, and when topped with a spoonful of stark white sour cream, the contrast is perfect. 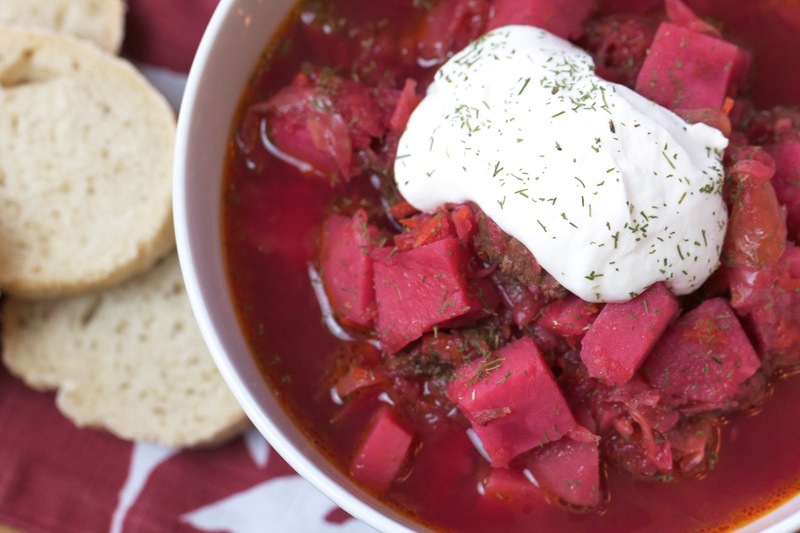 I can't vouch for the authenticity of this Borscht, as it's the only recipe I've ever used and the only one I've tasted as well. It came from a friend that had lived in Russia though so I would hope that it's somewhat authentic. Even if it's not, it's worth making. And because it makes a very large pot, there's plenty for meals all week or freeze it for later. In a large pot, heat olive oil over medium heat and then add the stew meat. Cook until the meat is lightly browned, 3-5 minutes. Add the onion and garlic and cook with the meat for 2 minutes. Add the butter and then the carrots, beets and cabbage and cook until softened 3-5 minutes. Add the stock and the potatoes as well as the remaining ingredients. Bring the soup to a low boil and then reduce to simmer. Simmer for the soup for approximately 90 minutes. Serve immediately or for best flavor, let cool and then refrigerate over night and serve the next day. 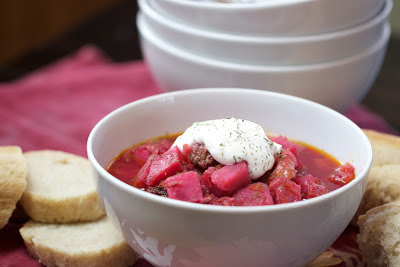 Serve with sour cream and chopped dill. 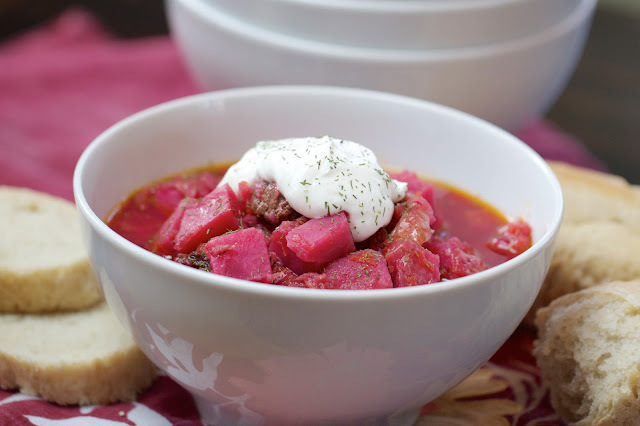 I made borsht only once but found it delicious! Have to try your recipe! Perfect for those chilly winter nights.